Sarah and Richard Matlock have been together for 30 years, and they have operated their marine sales and engineering business in Jersey since 1986. 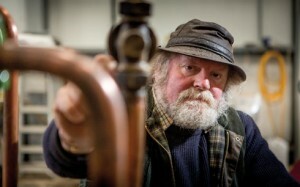 However, Richard has always had a passion for the countryside, cider, and restoring old machinery. 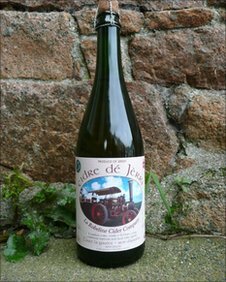 So in 2005 he decided to visit France to find out about artisan cider making traditions, and learnt how to make “cidre bouchee”. Sarah was happy for him to learn another skill and embark on a cider making hobby. Little did they know it would morph into today’s successful business making cider, Eau de Vie and sausages. Sarah has been kind enough to tell us a bit more about La Robeline Cider, and how she and Richard juggle the demands of running two successful businesses. We made the first batch of cider in the Autumn of 2005, launching La Robeline Cider at Farm Fresh Organics in July 2006. We sold that first batch of 1200 bottles in 6 weeks so knew that we had a market, if we chose to expand. A "Highly Commended" and "First Prize" at the Royal Bath & West Show two years running reinforced our conviction that we were producing a good product and we have expanded year on year as more of the orchards we have planted reach maturity. Each winter we plant more trees so we are on track to continue our expansion using only local apples. Having been entrepreneurs most of our working lives, it was an easy decision to start our own cider business. Richard loves the process of making the cider, we both love the fact that it is an artisan product made using traditional methods from local produce. We are passionate about quality, tradition and the local countryside, and about making a local product without any compromise. We are thrilled that the local community like what we are doing and are happy to support our endeavours. La Robeline Cider's business day has to be fitted in around our marine business, so there is no typical day. At this time of year, we are up relatively early, cider e-mails read and dealt with before Richard goes off to fix boats and I retire to my shed to deal with paperwork. There are also cider deliveries to be made and the promotion of La Robeline Cider, sorting out the transfer of licences, liaising with the organisers of various festivals, markets etc. and sorting out enquiries and orders. In between all of this, as the cider nears completion of it's secondary fermentation in the bottle, there is labelling and packing to do - not too time consuming as we do have a labelling machine now. Once Richard is home from "the day job", there is usually pork to be dealt with and sausages made for the next event - we have a full diary this year attending events every weekend between now and November. At the weekends, it's up very early, move the Cider Shack, Sausage Hut and cider trailer to whichever event we are attending that day, cooking loads of sausages and pouring lots of pints, answering people's questions and generally enjoying our day getting the product to the public. Typically we will get home at about 7 or 8pm after 12-14 hours on our feet, eat and collapse to recharge the batteries to do it all again the following day! In the late Autumn and winter, the boat business is relatively quiet so the emphasis shifts to harvesting apples and making the cider so the two businesses dove tail nicely with each other. 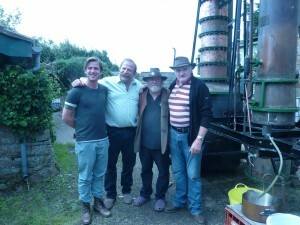 Last summer we acquired a 1940's wood fired, artisan, mobile still from a retired distiller in France. Affectionately named "Sylvie the Still", she needed complete restoration so Richard got to work revealing her inner beauty! She has rewarded us by distilling some of our cider to make a very palatable and apple-y "Eau de Vie de Jerri" which is now available. Some of this Eau de Vie has been put into oak barrels and is maturing slowly to make an apple brandy which we hope will be available soon. We have also distilled some beer for the Liberation Group to make their "Spirit of Liberation" - a delicious malty spirit retaining the flavour of the hops. Shortly we will be launching a vodka made from the Island's wonderful Jersey Royal potatoes - more details to follow as this venture comes to fruition! 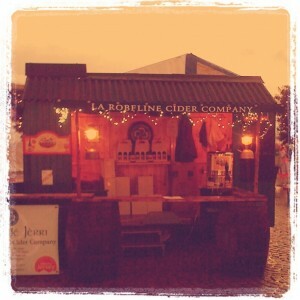 La Robeline cider is available from all the main farm shops, wine merchants and supermarkets. The Eau de Vie de Jerri can be found at Corkscrew in the market. 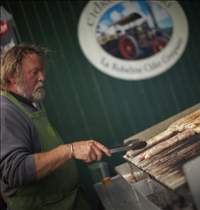 La Robleine’s distinctive Cider Shack and Sausage Hut will be at most of the Farm and Craft markets in the Royal Square, St Aubin's, St Catherine's and Weighbridge Place this summer. Also, at the Great Outdoors' Show, 8th and 9th June. Pick up a diary of events from La Robleine next time you see them at an event or follow La Robeline Cider and Sausages on Facebook, to find out where they'll be.